Apple Mac ProThere are few computers as exciting as a Mac Pro 2. The simplicity in design is reflected to a smooth operating system that lets you get on with your work without the hang ups of windows, no viruses and a computer built for audio production. 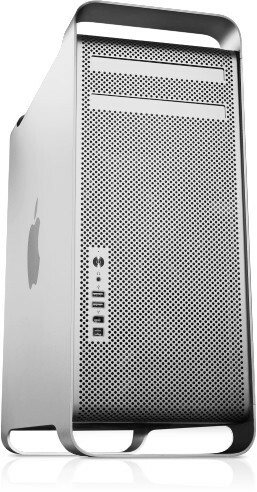 The possibilities are endless and the Mac Pro is available in three versions Mac Pro 2 x 2.0GHz Dual Core Intel Xeon, Mac Pro 2 x 2.66GHz Dual Core Intel Xeon and the maxed out Mac Pro 2 x 3GHz Dual Core Intel Xeon. Although all three models are quite similar nothing beats the Mac Pro 2 x 3GHz. The sheer power of the processor with the combination of the OSX core makes this a very fast PC. So the Top of the range Mac Pro apart from the 2x 3GHz Dual Core Intel Xeon processor, it also features a generous 4MB Shared L2 Cache with 1GB DDR2 ECC SDRAM (here you might find out that you need to spend a little more for at least another 1GB SDRAM). There is a respectable 160GB Serial ATA hard drive and 16x SuperDrive slot. You can add one more optionally and make this into a double SuperDrive. There another 3 PCI-Express Slots, a huge improvement from the previous G4 models and the NVIDIA GeForce 7300 GT 256MB Graphics Card is good for audio and better at games. The latest operating system Tiger has evolved into the nirvana of PC maintenance, it doesn't need any that is. No viruses and little adware means that you can use your MAC for music and also the internet without the fear of losing your precious tracks. #1Submitted by jasonla on Mon, 2008-10-27 03:45. Upgradeable to 32gb of RAM is one reason i love apple computers to do that with a PC you'd need a new motherboard most likely a new case and that costs a lot of money apples are a bit more expensive but the power is already there built in.